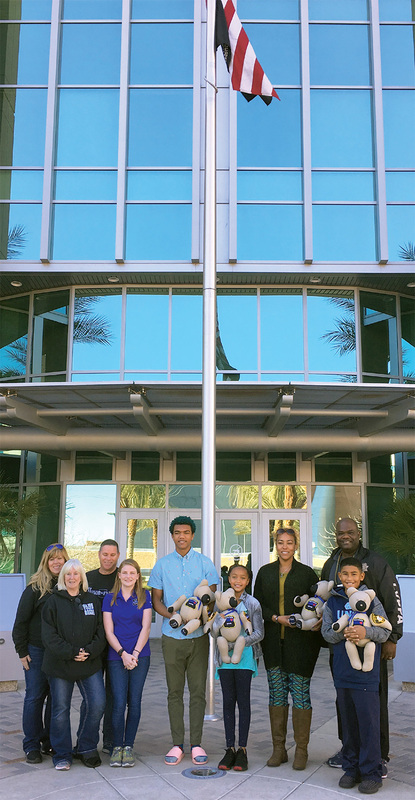 Megan O’Grady, fourth from left, and her family made stuffed bears for the family of LVMPD Officer Charleston Hartfield. 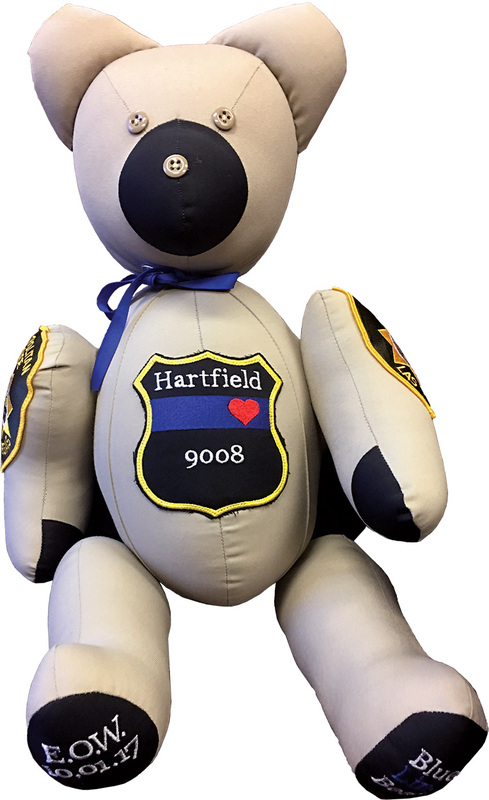 The bears honor Hartfield, who died in last year’s mass shooting on the Strip. I recently had the pleasure of meeting one of law enforcement’s biggest supporters. Megan O’Grady is the 15-year-old daughter of Sergeant Patrick O’Grady, a police sergeant in Florida. After five Dallas police officers were killed and nine injured in an ambush shooting in July 2016, Megan felt the need to show her support to the families affected. 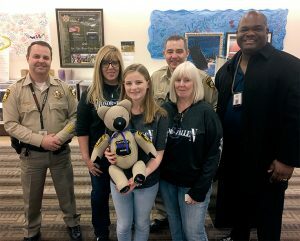 Megan, with the help and support of her mom and grandmother, began hand-making stuffed bears with the name and personnel numbers of fallen officers. These bears are then presented to the families of fallen officers across the nation. Sergeant Shawn Rompery of LVMPD/FTTU facilitated a phone call and introduced Sergeant O’Grady to the LVPPA. When the O’Grady family heard of the passing of our own Officer Charleston Hartfield (from last year’s mass shooting on the Strip) and realized they already had plans to come to Las Vegas, it became their mission to honor Hartfield’s family. With the help of her father and Sergeant Rompery, Megan contacted the LVMPD and obtained permission to construct bears made from the material of LVMPD uniforms. 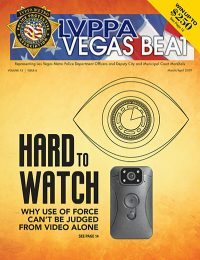 The bears also have the LVMPD patch on each shoulder, a shield with the name and P# of Officer Hartfield on the front, his end of watch date and a medal with a blue ribbon that has been blessed by a priest. The O’Grady family met with the Hartfield family at Metro headquarters on January 21 at 1300 hours. Megan explained how she began this endeavor and how it means so much to her to show her support to all law enforcement and their families. A bear was presented to each member of the Hartfield family, and I was so humbled to be a part of such a beautiful showing of love and support. Megan had made an additional bear and stated it was a gift for the entire Department. I felt it only appropriate that it be presented to the Department and shared by all the members of this great organization. On January 22 at 1300 hours, the O’Grady family returned to headquarters and presented the bear to Deputy Chiefs Andy Walsh and Tim Jones. The chiefs and Megan decided the bear should be placed in the lobby for all to enjoy. I am truly humbled by the generosity of the O’Grady family and by the strength and character of the Hartfield family.